U.S. Craftmaster® Hybrid Electric Heat Pump Water Heaters are the most cost effective, energy-efficient water heaters to help save money on your utility bills. They work by absorbing heat from the ambient air and transferring that heat to the water inside the tank. 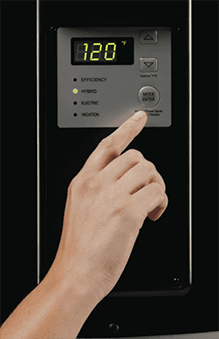 The Hybrid Electric Heat Pump can reduce water heating costs up to 66% and provide payback in 2-3 years. Plus it qualifies for many state and local utility rebates. Utilizes the heat pump for all water heating; automatically reverts to heating elements if ambient air or incoming water temperatures are outside optimal operating range for heat pump.